PRIME SOUTHBOUND COASTAL HIGHWAY PAD SITE FOR LEASE. FULL RIGHT-IN/RIGHT-OUT FROM COASTAL HIGHWAY AND ACCESS TO THE TRAFFIC LIGHT AT DARTMOUTH DRIVE (COASTAL HIGHWAY & FERRY ROAD). ADJACENT TO AND CONNECTED TO THE PARKING LOT OF HOMEGOODS, CITIZEN BANK, KITCHEN & COMPANY, AND CAPE WINE & SPIRITS. SITE PLAN APPROVAL FOR 3,000 SF RESTAURANT WITH DRIVE-THRU LANES. 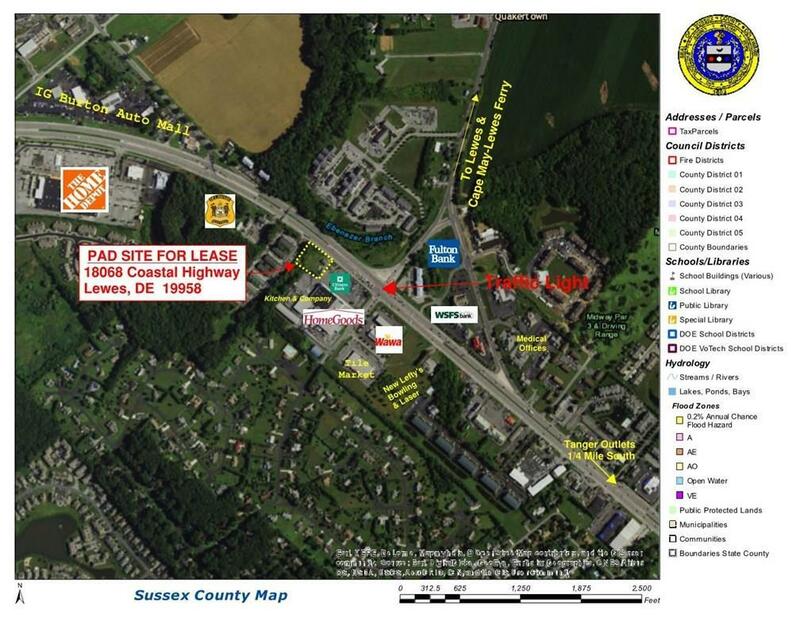 EASEMENT TO USE THE EXTRA PARKING IN ADJACENT HENLOPEN PLAZA SHOPPING CENTER. SEE ATTACHED AERIAL AND SITE PLAN.